Elastomer is a long chain of polymers which are cross linked together by the process of vulcanizations. These elastomers or rubbers are used to make a variety of materials which we use in our regular day to day life. 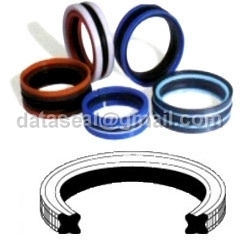 One such important compound is the rubber seals which are manufactured using a variety of rubber types based on the requirements and specifications posed by the consumer or the customer. The seal made of EPDM is black in color. These seals are mostly used in the rain water and waste water installations where there is no contact of the seal with petrol or oil residues in the water. The NBR seals are also black in color with a yellow spot to differentiate them. These seals can be used in waste and rain water installations where the residue is made up of oil or petrol. These are also used in gas stations, garages and petrol pumps. The FPM seals are purple in color and can be used over a variety of applications. The material seals are particularly heat resistant and oil resistant. They also show strong resistance towards strong acids and solvent. However, they have only a very limited resistance towards butyl acetate, acetone and methyl alcohol. 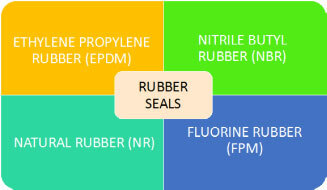 We manufacture a wide range of rubber seals that are manufactured using premium grade material such as silicone, viton, neoprene, nitrile, epdm, butyl, SBR, natural, polyurethane, hypalon, poly acrilic and many others. Precisely designed these seals have gained lots of recognition in the market for their exclusive features.